The birth of Gemini in Libra can be considered truly a miracle. They can look as if there are no family ties between them, and yet they have much in common. Both are air signs and belong to the same astrological family, which puts thinking above everything in life. And of course, it seems to the parents-Libra that it was just and reasonable that they were given a fresh stream of air. Air is an exceptionally changeable element, it is not always crystal clear. The hot air produces steam, the cold becomes foggy. When there are vortices, air generates a ferocious storm, calming down, becomes a refreshing breeze. So, even being air signs, Gemini and Libra are sometimes amazing and confusing each other. A sociable Gemini child looks lovingly at her talkative mother. She so skillfully acquires friends, that it causes him envy! She manages to establish relationships with all. Although Gemini easily establishes superficial friendships, Libra obviously knows how to make real friends. Libra mom pampers her little Gemini baby with new toys and beautiful things. He likes to receive unexpected gifts and is even able to circle his mother around his little finger when it comes to another purchase. Gemini is so charming that it can always achieve its own! A mother can say "no" if he goes too far, even a condescending Libra’s mom will not go on about him. It seems funny to him how simple he changes his decisions, if new, more tempting opportunities arise-she herself can not make up her mind for anything… Perhaps her child will play a positive role here, because he is so impatient that he always pushes Her to making a decision. Both are very fond of talking. Libra-mom is touched by the fact that Gemini is mastering this art at a very early age, and long conversations will please them. True, Libra can be difficult to transfer critical Twins, he is much more capable of analysis than she does. Besides, it just does not always cope with its rapidity. But the desire for mutual communication will help them to overcome many things. These two signs of air perfectly understand each other. To begin with, they constantly talk. True, Papa-Libra is a little disturbed by Gemini’s endless questions and his habit of expressing the most contradictory opinions. But the father is pleased that his child has such a bright and expressive mind! Gemini with new ideas is much easier than his father. Libra like a quiet life, in which everything goes in the right order and without unnecessary excitement. Well, Gemini is constantly on the move and looks out for what could take and entertain him. Sometimes Dad-Libra gets tired of even looking at this: can not you stop fussing and just relax? The twins are pleased to know that they understand him, because next to the father, he can be himself. 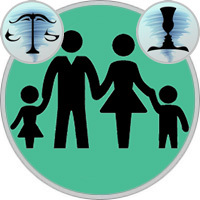 Most of the Libra fathers believe that children should not be asked for what they do not want - it’s much better to tell them delicately how to make the right decision. Of course, Gemini likes such a free approach, because he is so independent! These two people look at life with optimism, and both love to make their discoveries in it. As for disputes, the father tries to avoid them, showing restraint to prevent quarrels, while the quarrelsome little quarrel seems like fine fun. Libra treat your child very seriously - as if it is an adult, and this leads Gemini to rapture and at the same time teaches responsibility. He likes that his father always listens to everything he wants to say. These two are always interesting together, and they can expect a happy, even relationship.